It’s hard to believe it took this long but Bosch has finally released a cordless version of their most popular tool. The legendary Bulldog SDS+ rotary hammer. The Bulldog is one of Bosch’s most iconic tools and can be seen on job sites all across the country. We can say good things come to those who wait. The specs on the new Bosch GBH18V-26D is quite impressive. It puts out 1.9 ft. lbs. of impact energy. For comparison the Makita XRH04 hammer only puts out 1.4 ft. lbs. And the Milwaukee 2713-20 puts out slightly more at 2.1 ft. lbs. Bosch does not list the vibration rating like Makita does but knowing their past hammers we would speculate it will be quite good. 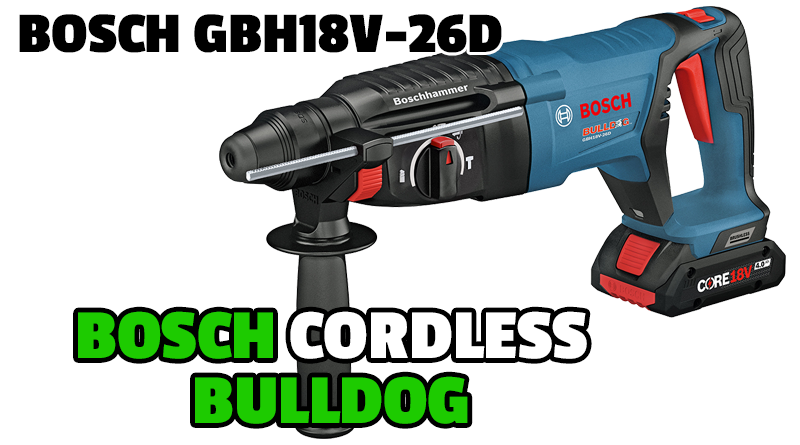 If you are somewhat familiar with corded Bulldog hammers then you are already up to speed with the operation and features of this new GBH18V-26D hammer. The new cordless Bulldog weighs in at 5.8 lbs minus battery and is compatible with their entire 18V Li-ion battery line. Anyone involved in the construction field right now knows how strong OSHA is pushing the new silica dust rules. Bosch has answered this by releasing their new GDE18V-26D battery powered dust extraction unit. The new GDE18V-26D is an integrated dust collector which quickly attaches to the following Bosch SDS Plus models. For corded units it will work with the 11255VSR, GBH2-28L and RH228VC. And then on the cordless side of things it’s compatible with only the new GBH18V-26D. This new GDE18V-26D is available as a bare unit, a kit with battery and charger or included as a kit along with the new GBH18V-26D hammer. This combination kit would be a great solution for a turn key OSHA compliant setup. When is comes to silica dust management Bosch is at the forefront of this new product category. Whether is be vacuums, attachments or their very cool Speed Clean dust extraction bits they have most bases covered. Be sure and check out our Bosch Silicosis Overview article. One last thought regarding Bosch and cordless tools. There has been a recent shift in the cordless tool world to upgrade their current battery technology. In the past lithium-ion has just been simple 18650 cells. Within these size sells we saw a bump in Ah from 3 to 6 over the past years. but now with the introduction of the larger 20700 and 21700 cells we are seeing a large increase of capacity with minimal physical size increase. Check out our article on Milwaukee High Output packs and Super Charger for in depth information on this subject. We have not received exact information yet but we expecting the new GBH18V-26D hammer to start shipping to dealers in the next month or so. The street prince on the bare tool will be around $220 and $299 to $399 in kit form depending on which kit you buy. As always once we get our hands on a test unit we will conduct a complete testing along side both cordless and corded comparative models.